The flood of new Tolkien-related books continues, and I havent been able to keep up. So here are brief looks at some of the books I have found time for. As is well-known, John Howe was, with Alan Lee, one of the two conceptual artists for the Peter Jackson films of The Lord of the Rings. This book highlights his career as an artist, emphasizing his Tolkien work but also showing other science fiction and fantasy cover art that he has done, with comments by some of the authors whose books he has illustrated. 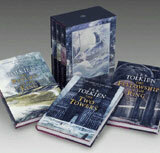 Howe has illustrated quite a number of Tolkien works, including various British editions of the History of Middle-earth series. These fine illustrations are probably much less known in America than in England, so many Americans will find in this book a way to appreciate Howes talents more fully. There are some added perks too-- an afterword by Alan Lee, a foreword by Peter Jackson, and some paragraphs by Sir Ian McKellen on playing Gandalf the Grey, and a few pages by Brian Sibley in appreciation of Howes work. This is a fine book, which will be well-appreciated by movie fans as well as anyone interested in artistic interpretations of Tolkiens works. The question whether one cares about finding God in Tolkien must be addressed before picking up this book. The authors are fundamentalist propagandists, and the book is laced with quotes from scripture and banal reflections set off separately from the text--e.g., "We are ruled by what we believe, whether it is true or not." (p. 102). Aye. I found this book to be a complete waste of time and money. Tolkiens Ordinary Virtues is, if possible, a kind of dumbed-down version of the above book, Finding God in The Lord of the Rings. There is nothing in it for one to learn about Tolkien, but there is a lot of mushy pablum in applying supposedly Christian virtues to characters and situations from The Lord of the Rings. This book, quite simply, is Christian product with a Tolkien slant. Unless thats what you are looking for, Id say stay away from it. Coming in the wake of reading the last two books, this book is like a ray of bright sunshine. Here at last is a consideration of Tolkiens philosophical and linguistic roots with an intelligent look at the Christian elements in Tolkienwith these elements considered as part of his whole mind-set and not cut out and simplified in an effort to proselytize his faith. Scholarly in approach and style, this is a revised edition of a book first published in 1983. It is an essential book for a scholarly appreciation of Tolkiens writings. "This cross-disciplinary analysis shows that Tolkien presented to modern readers and other writers a rich array of reinvented mythic archetypes and icons: the desperate quest (good vs. evil); a magical object that embodies or initiates the quest (the ring); the wise wizard who oversees or aids the quest (Gandalf); the reluctant hero, an ordinary person with untapped abilities (Frodo); the heros loyal friend and supporter (Sam); the warrior king whose true identity is hidden (Strider/ Aragorn); and the goddess figure (Galadriel)." For myself, I dont know much about comparative mythology, but this is an interesting approach, and a different one from that usually found in works on Tolkien. Though the book is centered on The Lord of the Rings, I would have liked to see the authors views on Tolkiens legendarium as a whole. This book presents a kind breezy amalgam of facts and errors about Tolkien in a question and answer format. There are approximately three dozen questions, including "Why Is Frodo in Caves So Often? "; What Makes a Forest Walk? "; "Could Middle-earth Be More Magical?" and "Why Do the Best Swords Break?". The answers seem cobbled together in a manner that recalls a college-students all-nighter with several Tolkien books and a few encyclopedias of mythology. Add to that some bad art to fill the pages, and you have a timely book whose publication coincides with the release of a successful movie. The authors previous book, from 2001, was The Magical Worlds of Harry Potter. Can you say hackwork? "This book is a basic introduction only, a nuts and bolts survey of Tolkiens life and works. It is meant for the general reader of Tolkien, the person who desires to know him a little better and wants to go past the movie and fanzine hype. The literature about him, both scholarly and popular, is so enormous that it would take a much larger book (or books) to interact adequately with the literally hundreds of detailed studies, interpretations, synopses, investigations, and analyses of Tolkien and his works that have been written (many of them excellent) starting over a half century ago. In this work I chose not to concentrate solely on the Hobbit and the Lord of the Rings, both of which have had more than their share of scrutiny. I have given comparable space, or as close to that as possible, to Tolkiens other published works, including the lesser-known works for children, his oft-neglected poetry, his academic essays and talks, the posthumous Middle-earth writings edited by his son, his collected treasure-trove of letters, and some other obscure pieces. My hope is that this book will whet the readers appetite for all of Tolkien, and inspire him or her to read what is now currently popular . . . and then go beyond." Which sums up the book precisely. And as a kind of readers guide to Tolkien, it does its job pretty well.